Explaining the macroeconomic context for growth and employment, the global employment situation, and regional economic & labour market developments. 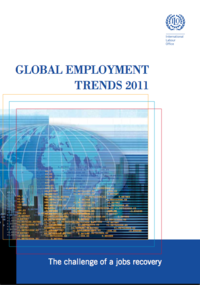 A central theme of this Global Employment Trends 2011 report is that while global economic growth is rebounding on a better than expected trajectory, the global labour market is, in many respects, behaving as anticipated in the middle of the crisis and highlighted in the Global Employment Trends 2010 report: stubbornly elevated unemployment and slow employment generation in developed economies coupled with widespread decent work deficits in even the fastest-growing developing economies. In the context of a robust, though uncertain and unbalanced economic recovery, these labour market challenges represent a serious threat. Without a sound and sustainable recovery in labour markets – one that helps to address the global imbalances that contributed to the crisis – the broader macroeconomic recovery will find itself resting on an uncertain and weakening foundation. All whitepapers are available to you and free of charge. This whitepapers is provided by ILO - International Labour Organization.